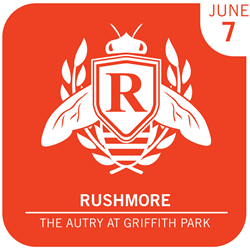 Eat|See|Hear will show the 1998 film Rushmore at Autry National Center in Griffith Park on Saturday, June 7. The evening begins at 5:30 p.m. and will include a performance by local band Thieves. We're looking forward to showing 'Rushmore' on June 7 and filling the evening with good food and the feel-good harmonies of Thieves. LA’s premier outdoor movie series Eat|See|Hear will be showing “Rushmore,” the 1998 film directed by Wes Anderson and starring Jason Schwartzman, on Saturday, June 7 at The Autry National Center in Griffith Park. Doors to the event will open at 5:30 p.m. Food trucks will be on location and a live performance by LA band Thieves will begin at 7:30 p.m., presented by Origami Vinyl. The movie will start at 8:30 p.m. Tickets may be purchased in advance online or at the door on the night of the event. The Autry National Center is located inside Griffith Park at 4700 Western Heritage Way across from the Los Angeles Zoo. A museum specializing in the American West, The Autry has a range of exhibitions and installations that includes lectures, films, festivals, events and music. The Eat|See|Hear event will be held on the large lawn outside. The event is dog-friendly. Free parking is available at the L.A. Zoo parking lot and bike parking is available inside the park as well. The evening will include a variety of LA food trucks including Trailer Park, Vizzi Truck, The Gastrobus, Peaches’ Smokehouse BBQ, Asian Cravings, The Fry Girl, Sweet E’s, Coolhaus, Brasil Kiss and more.